The Bounty Hunter Discovery 2200 Metal Detector is a feature-packed device from which people of all ages can derive entertainment and pleasure. It is highly efficient and constructed from high-quality materials so that the product delivers at optimal performance, and is the best value for your money. Read the rest of this review and rate this item for yourself. 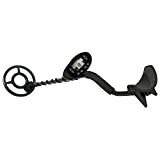 This is a perfect metal detector for anybody looking for a good buy – from professional searches right up to simple entertainment or hobby – this item is a fantastically fitting buy for all. The wide search coil and the deep search capabilities of the Bounty Hunter Discovery 2200 make it an excellent tool for searching through several inches of soil or even water – thanks to the waterproof nature of the coil. The lightweight design, the adjustable aluminum stem and the ability to adjust the padded armrest make it a comfortable item for uses by all kinds of people of different ages, sizes, and heights. Also, the fact that it is covered by a 5-year warranty helps keep you, as a buyer, confident in the quality of the product you are buying and knowing that you have support should there be defects or manufacturing faults. The headphone jacks are great for when you wish to use the product in noisier areas, public zones, or simply for privacy. The coil is kept parallel to the ground thanks to the built-in automated coil balance system. You can easily accept or reject targets using the Zap mode. Basically, the pros of this item can go on and on! If you need me to put a finger on its negative aspects, I would say the item carries a slightly pricier tag but for its high price, for its performance and for the quality of the materials that the device is constructed from, it is actually a reasonably fair price. The main reason for buying this product is its superior quality and durability, its versatility and simplicity. This item may be pricey, but it certainly is worth spending your hobby money on for hours of fun over several years – disappointment free – guaranteed! If you are not convinced of this, just take another – proper- look at the long list of pros of the Bounty Hunter Discovery 2200 and you’re sure to be convinced, then! The verdict on this product is a 4.5-star rating and a high recommendation. The Bounty Hunter Discovery 2200 Metal Detector is certainly a fitting buy for all out there who are in search of a good metal detector.